Grace Jones is quite the character. Many people know her merely as a bizarre gay icon with an eccentric taste, or as a former Bond girl and occasional actress, or as a model who hung out at studio 54, partying wildly and serving as a muse for Andy Warhol. There's more to her, however, as she also has an extensive career in music that has gone somewhat unnoticed by many, or maybe it's just been overshadowed by her controversial public image. Her 2008 album Hurricane is stellar in three ways: not only is it single-handedly one of the most spectacular releases of its year, it's also an actually good comeback album which is always a feat. She had been absent from the music scene for 19 years (!!) and expectations tend to build up in such amount of time. Thankfully, the album lives up to them. 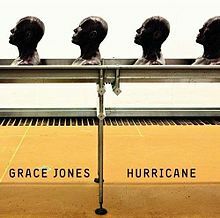 Thirdly, she was at the age of 60 when the record was released, and many artists have the sad habit of repeating themselves as their careers develop, but not Grace: Hurricane is an innovative sonic adventure, sounds perfectly fresh and - in my opinion - is her best LP to date. This is Grace Jones like you've never heard before. Even though the album features several trademark elements of Grace's (reggae beats, Jamaican vibe, spoken word lyrics) there are also many new things like the electronic sounds as evidenced in the nearly industrial sounding "Corporate Cannibal". The album kicks off with the bouncy opener "This Is", which features the much-cited opening lines "This is my voice / My weapon of choice". A bit later she states what the album is all about: "This is a voice, these are the hands / This is technology, mixed with a band". Next song, the magnificent "Williams' Blood" is a soaring fusion of pop and gospel that explodes in the chorus filled with distorted guitars and backing vocals. One of the highlights of the album and also released as a single, this song certainly doesn't pale in comparison with older Grace Jones classics such as "Pull Up To The Bumper" and "Slave To The Rhythm". The song also includes excerpts from the hymn "Amazing Grace", which sounds like it could be a wee bit tacky (you know, with her name and all), but it isn't - it all sounds very sincere and well, graceful. Lyrically the album showcases Grace as a storyteller, especially on autobiographical tracks like "Williams' Blood" and "I'm Crying (Mother's Tears)", an ode to her mother. "Corporate Cannibal" is an assault against modern-day capitalism and the corporate world with powerful lyrics such as "I deal in the market / Every man, a woman, a child is a target" and "I'll consume my consumers / with no sense of humour". You can tell she's not playing around. Then there's "Sunset Sunrise", penned by her son Paulo, which deals with humans' relationship to nature ("Is it yours? / Is it mine? / Is it ours to divide?"). The album also shows how talented she is as a singer and it isn't the production or over-using of auto-tune that makes you think so - trust me, I've seen her live. With TV characters such as Barney Stinson from How I Met Your Mother overusing the word "epic" in every possible instant, it has suffered quite an inflation, but there are two songs on the album that virtually cannot be described without it: Hurricane and Devil In My Life. The latter, despite being the album closer, is actually the first song to be written for the album, and features stunning string arrangements. Ending the album on a strong note, it leaves the listener transfixed. Hurricane, the Tricky-featuring title track, is a majestic six and half minute trip-hop number that shows how fierce she can really be. It serves as a stand-out centerpiece for the album and unfurls into a genuine powerhouse and when she declares "And I'll be a hurricane! / Ripping up trees" the listener is convinced that she's not exaggerating the tiniest bit. "See me / Here I come!" she chants as she shows the rest of the world how a comeback is properly made. Try at least: "Williams' Blood", "Hurricane", "Devil In My Life"